Your Home Teacher for Indian Classical Music. 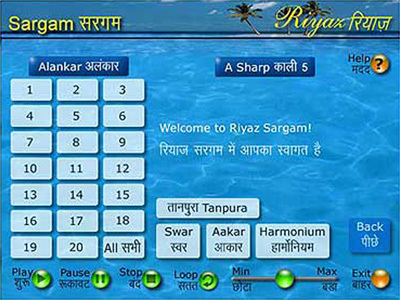 Riyaz Sargam, is a computer based Interactive CD - Rom which provides 20 basic musical exercises [ shuddha alankars ] of ICM [ Indian Classical Music ]. 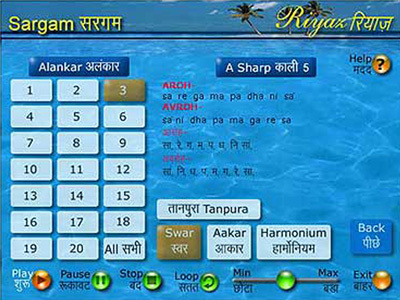 Alankar means various combinations of swars [ i.e basic notes of ICM - sa,re,ga,ma,pa,dha,ni ] designed under specific rules with a definite order and sequence. 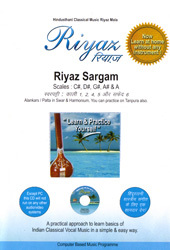 Exercising alankars is the very first step in the learning process of ICM either of north Indian music or south or carnatic classical music. 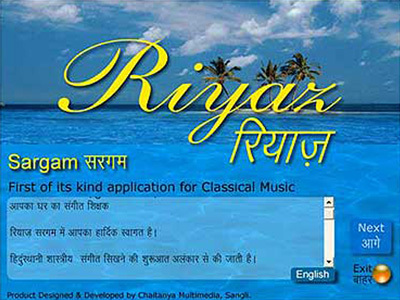 Riyaz Sargam, is a unique tool on ICM [ Indian Classical Music ] which provides musical exercise to beginners, professional singers and professional artists, who do not get time to do Riyaz due to their schedule. Just exercise in your scale, for 10 to 15 minutes, prior to your public performance to achieve best results, increasing comfort and confidence in singing. Twenty such Alankars are given for practice. They are all quite useful and suffice as a basic course. 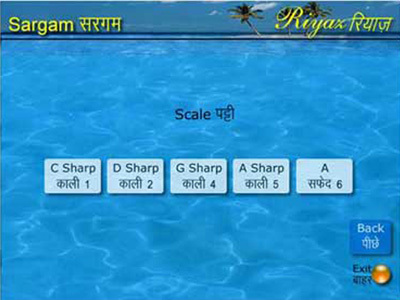 Scales: C s [ Kali 1 ], D s [ Kali 2 ], G s [ Kali 4 ], A s [ Kali 5 ] and A [ Saphed 6 ].